This Oyster Bay Estates residence designed by accomplished architect, Thorning Little, embodies classic Italianate design with Moorish influences. 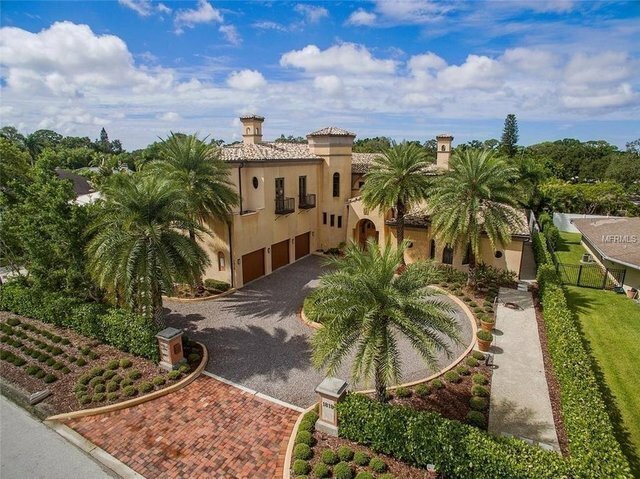 Framed by mature palms and lush hedges, this West of the Trail home exudes Palm Beach garden glamour fused with remarkable sustainable features. The interiors of this 3 or 4-bedroom home are romantic and refined, encompassing 5,968 square feet of living space.An open layout of artistic and inspiring spaces is enhanced with imported hand-carved Italian limestone pillars, natural gas fireplaces, and Sannini Italian tile floors throughout. While the family relaxes in the adjacent TV/family room, experience culinary excellence in the gourmet kitchen with sleek Italian cabinetry and state-of-the-art appliances. The spacious office has a beautiful library area with beamed ceilings and bookshelves along with custom cherry wood dual desks and decadent storage. The large theatre room could easily convert to a 2nd master suite.Exceptional outdoor entertainment areas incorporate verandas, expansive stone patios, a perimeter Gabion rock wall, and a Florida-friendly lawn surrounding the shimmering saltwater pool and spa. Features include elevator, green design, smart-home features including 7.6 KW solar array, outside air make-up and dehumidifier, and 13 KW natural gas emergency generator.Oyster Bay Estates residents appreciate proximity to excellent schools, the nearby Field Club, Southside Village, arts and culture, and the world-famous sands of Siesta Key.